The ship's volunteer crew has already faced severe weather conditions on the journey from Denmark to Norway, with several individuals being taken off the Sea Stallion temporarily because they were showing the early signs of hypothermia. The crew had rowed out of the port of Eigersund, on the Norwegian coast, hoping to pick up a good breeze - but it never came. The decision to abandon the sail and take a tow to Kirkwall, on Orkney, was taken after weather forecasters told the crew they could find themselves stuck in the middle of the North Sea just as fierce gales blew up. A rope was then slung across from the support ship, Cable One, which motored to Scotland. They were expected at Kirkwall on Tuesday afternoon. The North Sea segment is part of a much longer, 1,000-mile round trip from Denmark to Ireland over seven weeks. 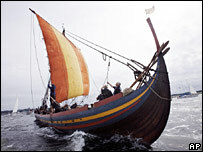 The research project is intended to gain insight into how Vikings used their ships to make great sea journeys. "As a consequence of the decision of towing the Sea Stallion across the North Sea, this part of the passage has now been cancelled in the research plan for 2007," said Viking Ship Museum director Tinna Damgard-Sorensen. "Primarily, this affects the part of the research programme dealing with the trial voyage itself - the possibility of estimating the travel speed across the North Sea, and the possibility of evaluating the functions and the logistics on board during a long crossing. These aspects will be reassumed during the voyage from Ireland to Denmark in 2008," the museum official told the project website. The ship's crew are writing a weekly diary for the BBC News website. More regular updates and a map of the ship's latest position can be found at BBC History's Viking Voyage website.